Before my time the danish snaps factories did produce a whisky (CLOC) which apparently weren't very good. 6. Fary Lochan. Distillery. Traditional Scottish Pot Stills. Production started very late 2009. Various exotic white whisky products available. First Whisky was released 28. September 2013 and since the distillery has released small batches regularely. 8. Nordisk Brænderi. Gin/Snaps/Fruitbrandy distillery. Müller Still. Very little whisky on the side. First whisky put on cask in September 2010 and was released in November 2013. Here are some links to the official webpages of 2-8, you might need the help of google translate to get some sense of it. Do you have a question about whisky? Are you looking for help with a tasting? 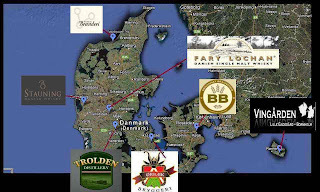 Spørgsmål om whisky er velkomne!! Mangler du hjælp til en whiskysmagning? Below 70 : Made me cry!